There was rain in Manchester this morning but by the time the conference got under way on Wednesday the skies were already brightening! The morning keynote session was delivered by Professor Martin Hall Vice Chancellor the University of Salford, our conference host. In ‘Openness: the essential Quality of Knowledge’ Martin gave a thought-provoking and entertaining talk focused on the question “What a fully open-access university, structured around an open access repository for publications, resources and data sets, look like?” He argued that openness drives the knowledge economy. The closure of knowledge restricts innovation and is alien to the essential qualities of a university, especially in the context of how why universities were established and evolved: to allow experts or academics in a field to share their knowledge in exchange for academic reputation. He asked publishers to look at their current business models and develop tools that could aid open access publishing and encourage a new era of openness in the world of academia. One comment made by Martin that was particularly popular with the audience was that he considers all people involved in populating and promoting Open Access Repositories as heroes. It was good to hear that librarians and information professionals are appreciated in this role! This first keynote session was followed by ‘Poster Madness’. 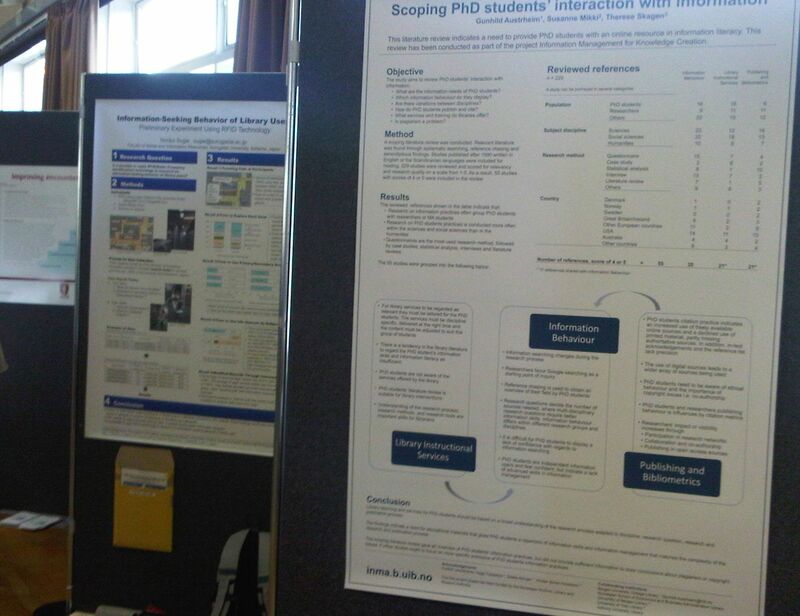 This was a one minute madness presentation opportunity for those delegates presenting posters at the conference. I hadn’t experienced the one minute format before and was thoroughly impressed by the participants’ ability to provide coherent outlines of their research in such a short period of time. There was a second madness session in the afternoon, so I review both together here. I feel that I need to make special mention of those presenters that particularly impressed me. Mary Dunne from the Health Research Board in Ireland presented one minute on her ‘Barriers and facilitators to research use: the role of library and information services’ in poetry form. I also enjoyed Emma Thompson’s minute. She remarked on her position as one of just a couple of business librarians attending the conference. She questioned how to encourage all subject librarians to get involved in EBLIP. ‘EBP by stealth’ was her recommendation! After the morning coffee break I attended the “Innovation, Education and Research: Theory and Searching” strand. Jason Eyre of De Montfort University discussed an alternative outcome to The PITSTOP project (Supporting Students On Placement Using Social Media). In “Learning by example: developing evidence based library and information practice through supporting academic programmes with a culture of evidence based practice”, his main message was that social workers work in a ‘real’ world environment where peer approval, time constraints etc. mean that EBP is NOT practised. We need to remember that our students will be moving into real-world situations and careers, where they may not even have access to the suite of resources that their academic library provides. Our teaching of IL needs to fit with this experience, and empathy is key. This presentation made me reflect on how I approach IL instruction with nursing and medical students and how we need to offer advice and training that can fit into the real world of our students. The afternoon keynote session of the day was delivered by Dr Ross J Todd, Associate Professor in the School of Communication and Information at Rutgers, the State University of New Jersey and Director of the Center for International Scholarship in School Libraries (CISSL), at Rutgers University. This was another inspirational keynote address, this time reflecting on EBP from the School Librarianship perspective. The whole day was informative, engaging and thought provoking. I have a lot to reflect on in my own practice as an academic library professional and many issues to consider relating to how our profession can embrace EBP more fully. I think perhaps a good starting point would be the adoption of the evidence for practice, evidence in practice and evidence of practice holistic model in both our practice and research activities. I’d like to take this opportunity to once again thank the LIS Research Coalition for the chance to attend EBLIP6. So far it’s been a very rewarding experience and I’m looking forward to the final day of what has been an exciting conference. 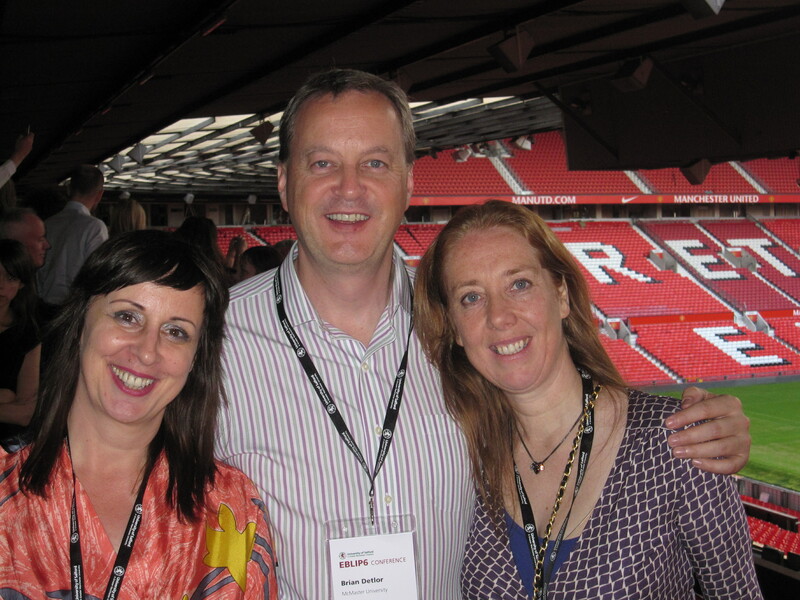 The conference dinner was held on Wednesday evening at Old Trafford, the home of Manchester United. It was very exciting for many to have the opportunity to see the team’s museum and ground, and to eat and be entertained in the hospitality suite.